Bile acids (BAs) are the major metabolic product of cholesterol, having detergent-like activities and being responsible for absorption of lipid and lipid-soluble vitamins. In addition, it has been increasingly recognized that BAs are important signaling molecules, regulating energy metabolism and immunity. Under physiological circumstances, synthesis and transport of BAs are precisely regulated to maintain bile acid homeostasis. Disruption of bile acid homeostasis results in pathological cholestasis and metabolic liver diseases. During the last decades, BAs have been gradually recognized as an important therapeutic target for novel treatment in chronic liver diseases. 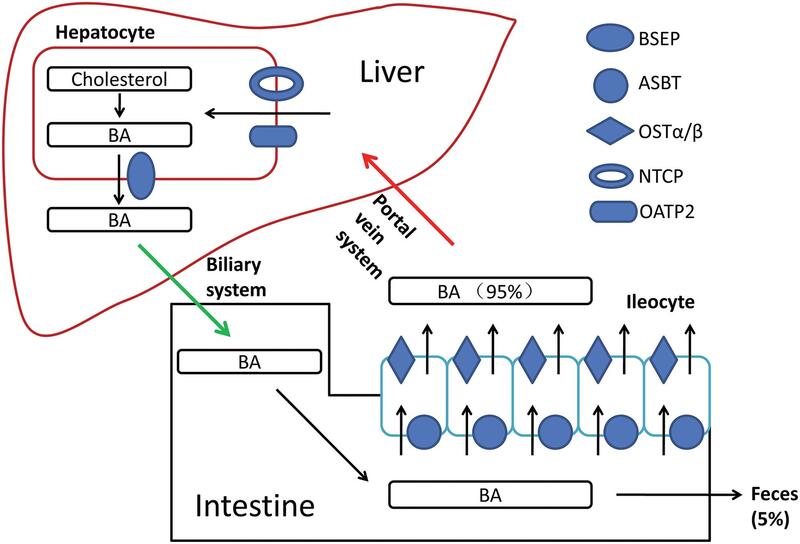 This review will provide an update on the current understanding of synthesis, transport and regulation of BAs, with a focus on the therapeutic roles of bile acid signaling in chronic liver diseases. Bile acids (BAs) are the primary end metabolic product of cholesterol, having detergent-like activities and playing important roles in lipid absorption and utilization of lipids. As natural detergents, BAs might disrupt lipid components of cell membranes and advocate oxidative damage. Hence, accumulation of BAs within hepatocytes actually leads to apoptosis or necrosis of hepatocytes, which is principally responsible for cholestatic liver damage.1 Besides, BAs are also natural ligands for several nuclear receptors and membrane receptors, including farnesoid X receptor (FXR), pregnane X receptor (PXR), vitamin D receptor (VDR) and transmembrane G protein coupled receptor 5 (TGR5). BAs are important signaling molecules as well, playing critical roles in regulation of multiple metabolic pathways, including lipid, glucose, drug and energy metabolism. Additionally, BAs play a vital role in gut bacteria homeostasis. BAs have been considered as important therapeutic targets for treatment of cholestatic and metabolic liver diseases.2 Cholestatic liver diseases are currently associated with impaired bile flow and accumulation of BAs within the liver, resulting in hepatic inflammation and liver injury. Chronic cholestasis increases the risk of hepatocellular carcinoma and cholangiocarcinoma. And, it has been illustrated that FXR and BAs play important roles in both alcoholic liver disease (ALD) and nonalcoholic fatty liver disease (NAFLD).3,4 The emerging therapeutic roles of bile acid signaling in chronic liver diseases are discussed in this review. BAs are principal components of the bile, which mainly contains bilirubin, cholesterol, phospholipids, electrolytes, and water. Synthesis, transport and pool size of the BAs are precisely regulated under physiological conditions. As the predominant end product of cholesterol catabolism, synthesis of BAs is a complex process within hepatocytes. A series of the cytochrome P450 subfamily members are involved in the process of BAs production. There are two distinct pathways responsible for primary BAs production. BAs conjugated with glycine or taurine are known as bile salts, which are more hydrophilic, facilitating secretion into the bile. Moreover, bile salts are generally considered to be less toxic. Bile acid:CoA synthase (BACS) and bile acid:amino acid transferase (BAT) are required in this procedure.6 Conjugated BAs are then secreted via the bile salt export pump (BSEP) into the canaliculi. Secreted primary BAs gradually flow through the canaliculi, interlobular bile ducts, left/right hepatic duct, and common hepatic duct, eventually reaching the gallbladder. BAs are currently stored and concentrated in gallbladder. The concentrated bile in gallbladder flows into the intestinal lumen through the major duodenal papilla after food intake. In the intestine, primary BAs are metabolized by gut bacteria, producing secondary BAs, mainly including deoxycholic acid (DCA), lithocholic acid (LCA) and ursodeoxycholic acid (UDCA). Both primary and secondary BAs comprise the total BAs pool, with a relatively fixed proportion. Alteration of the size and composition of the BAs pool might accelerate pathological processes, such as cholestasis and cholelithiasis. BAs are amphipathic molecules with detergent-like actions, which are responsible for their roles in facilitating absorption of lipid and lipid-soluble vitamins in the intestine. After their physiological functions are completed in the intestine, the BAs reach the distal ileum, where 95% of BAs are reabsorbed via a sodium-dependent process. The apical sodium-dependent BA transporter (ASBT) expressed in the brush border membrane of the distal ileum is the major transporter mediating the reabsorption of BAs. ASBT mediates the active transfer of BAs across the luminal plasma membrane to the ileal bile acid binding protein (IBABP), which facilitates intracellular diffusion of BAs to the basolateral membrane. The organic solute transporter (OSTα/β) mediates the exit of BAs across the basolateral plasma membrane, and BAs then enter the portal bloodstream. Under physiological circumstances, the synthesis of BAs is precisely regulated by a complicated net of multiple signaling pathways. Regulation of CYP7A1 transcription, the rate-limiting enzyme of BAs synthesis, is the most critical step of several pathways. The enterohepatic circulation of BAs plays a vital role in feedback inhibition of BAs synthesis. Circadian rhythm, food intake, thyroid function, as well as gut microbiota play important roles in regulation of BAs synthesis. FXR also stimulates bile acid conjugation by up-regulation of BACS/BAT transcription, which greatly affects the composition of the BAs pool. Furthermore, FXR binds to the BSEP gene promoter and induces the expression of BSEP in the canalicular membrane, facilitating bile acid secretion. Thus, it is concluded that FXR is of vital importance in the regulation of BAs synthesis, enterohepatic circulation and internal composition of the BAs pool. Currently, FXR deficiency is known to result in cholestatic diseases. The gut microbiota regulates BAs synthesis and metabolism. The gut microbiota is responsible for deconjugating BAs and converting primary BAs into secondary BAs.19 In humans, Lactobacillus, Bifidobacteria, Enterobacter, Bacteroides, and Clostridium are mainly responsible for BAs metabolism in the gut. It has been suggested that altering the intestinal microbiota evoked by any influencing factors would subsequently alter the composition of intestinal BAs.20 In healthy human beings, cholesterol is primarily catalyzed to CA and CDCA via the classical bile acid synthetic pathway. Bile acid 7α-dehydroxylating bacteria are abundant, maintaining the normal composition of BAs pool. Thyroid function is another important factor regulating BAs synthesis. Cholestatic changes currently occur in patients with hypothyroidism. It has been confirmed that thyroid hormone reduces proprotein convertase subtilisin/kexin type-9 (PCSK9) and stimulates BAs synthesis in humans.23 Song et al.24 suggested that thyroid-stimulating hormone (TSH) represses BAs synthesis via a SREBP-2/HNF-4α/CYP7A1 signaling pathway, independent of thyroid hormones. Furthermore, UDCA has recently emerged as a promising therapeutic medication for polycystic liver diseases. It has been confirmed that UDCA inhibits hepatic cytogenesis in experimental models of polycystic liver disease and improves symptoms in patients.32,33 However, up to 40% of PBC patients are nonresponders to UDCA therapy, who have poor prognosis despite full-dose UDCA medication. Hence, novel therapeutic approaches are required regarding UDCA nonresponders and the limited efficacy of UDCA in cholestatic disorders other than PBC. FXR was first identified in 1995 as an orphan nuclear receptor. It is involved in a variety of physiological processes, including development, differentiation and metabolism. The hydrophobic BAs, as well as farnesol, are natural ligands of FXR. CDCA is the most efficacious endogenous FXR ligand, whereas hydrophilic BAs, such as UDCA and muricholic acids, do not activate FXR. Similar to most nuclear receptors, FXR consists of a transactivating domain (TAD), DNA binding domain (DBD), helix, and ligand binding domain (LBD). Corresponding ligands bind to LBD of FXR, forming a heterodimer with retinoid X receptor (RXR) and accompanied by DNA conformational changes. DBD is then exposed and actually binds to the cis-regulatory element located in the targeted gene promoters, regulating transcription of targeted gene. As noted above, FXR down-regulates CYP7A1 gene transcription via the SHP/HNF-4α/LRH-1 pathway and the FGFR4/β-/JNK/ERK pathway. FXR activation down-regulates NTCP and ASBT transcription, whereas it up-regulates BSEP, BACS/BAT, OSTα/β as well as IBABP transcription. FXR activation also prevents BAs toxicity by up-regulating detoxification enzymes.39 Hence, FXR plays a key role in the regulation of BAs synthesis, excretion, transport and metabolism, and it is a prospective therapeutic target in cholestatic and metabolic liver diseases. BAR502 is a dual FXR and GPBAR1 agonist, which protects against liver damage caused by high-fat diet by promoting the browning of adipose tissue.45 Another study demonstrates that 3-deoxy-6-ethyl derivative of CDCA (BAR704) might reduce liver fibrosis by interfering with the TGF-β/SMAD3 pathway in hepatic stellate cells. In short, FXR is a prospective therapeutic target and requires further studies in the near future. Fibrates are PPARα agonists, which are traditionally used in the lipid-lowering therapy. It seems that combination therapy with UDCA and fibrates in PBC patients who are incomplete UDCA responders may improve prognosis.47–49 It has been recently elucidated that fenofibrate inhibits intrahepatic cholestasis via the PPARα-dependent JNK signaling pathway.50 However, safety and cost-effectiveness of fibrates therapy requires further evaluation. TGR5 is considered as a potential therapeutic target in treatment of cholestasis and metabolic liver diseases; however, further studies are in demand to evaluate long-term therapeutic efficacy and safety. BAs are natural detergents that play important roles in absorption and utilization of lipid. Accumulation of BAs within hepatocytes actually results in cholestatic liver damage. BAs are important signaling molecules, regulating multiple metabolic pathways, including lipid, glucose, drug and energy metabolism. As such, BAs have been considered as therapeutic targets for treatment of cholestatic and metabolic liver diseases. We have discussed herein the emerging therapeutic roles of bile acid signaling in chronic liver diseases. New therapeutic agents were also discussed and the further investigation required for efficacy and safety evaluations. It is anticipated that bile acid signaling will give birth to more inspiration in the near future. Synthesis of bile acids (BAs) occur within hepatocytes and BAs are secreted into bile via bile salt export pump (BSEP). 95% of the bile acid pool are re-absorbed in intestine. Apical sodium-dependent BA transporter (ASBT) expressed in the brush border membrane of the distal ileum mediates bile acids crossing the luminal plasma membrane into ileocytes. Organic solute transporter (OSTα/β) mediates bile acid exiting across the basolateral plasma membrane into portal bloodstream. Circulatory bile acids are taken up by taurocholate cotransporting polypeptide (NTCP) and organic anion transporting proteins (OATP2) at the basolateral membrane of hepatocytes, and then exported into bile by BSEP. Fig. 2. Feedback regulation of bile acid (BA) synthesis through farnesoid X receptor (FXR). Cytochrome P450 7A1 (CYP7A1) is the rate-limiting enzyme of BA synthesis. 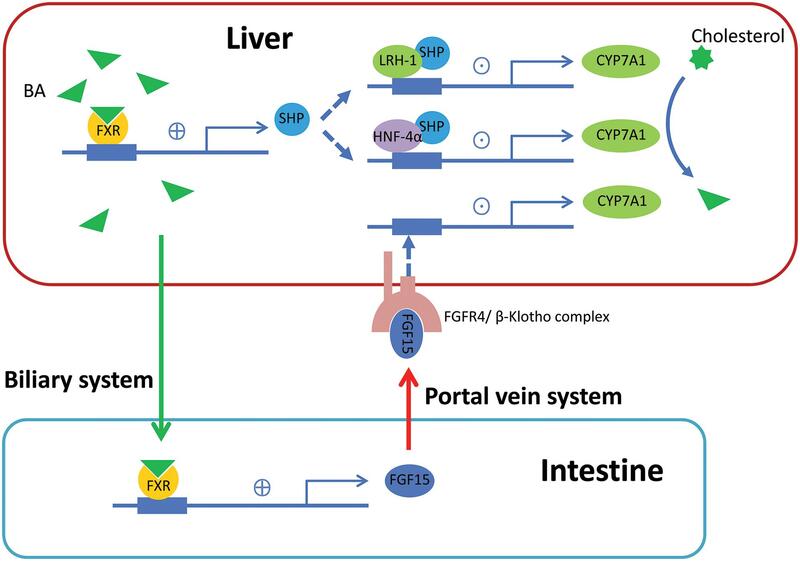 In the liver, BA binds to FXR to induce expression of small heterodimer partner (SHP), which inhibits transcriptional activity of hepatocyte nuclear factor 4α (HNF-4α) as well as liver-related homologue-1 (LRH-1), and down-regulates CYP7A1 transcription. In the intestine, BA binds to FXR to induce fibroblast growth factor 15 (FGF15), which is secreted into portal bloodstream and finally activates hepatic FGFR4/β-Klotho complex, initiating a regulatory cascade to repress CYP7A1 transcription. The authors have no conflict of interests related to this publication. Wrote the review (YL), edited the review (LGL). Copyright © 2018 Authors. This is an Open Access article distributed under the terms of the Creative Commons Attribution-Noncommercial 4.0 License (CC BY-NC 4.0), permitting all non-commercial use, distribution, and reproduction in any medium, provided the original work is properly cited. © 2019 Xia & He Publishing Inc.